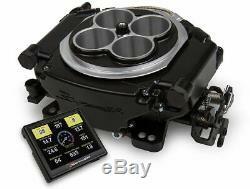 Holley Sniper EFI Self-Tuning Kit w/ Handheld Monitor (Black) - HO550-511. Sniper EFI Self-Tuning Kit Black Finish With Handheld EFI Monitor. 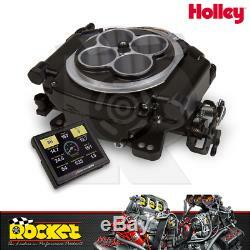 Holley just brought EFI within range! Perfect for street rods, muscle cars, off road trucks or nearly any carbureted vehicle. Put an end to cold start issues, hesitations, vapor lock, and flooding. Upgrade to Sniper EFI and get the tactical accuracy of EFI today! Bolt on carburettor replacement (designed to fit single & dual carb manifolds). Throttle body mounted ECU no extra boxes to mount. Supports up to 600hp (4 injector version). 4 wire vehicle connection (Battery +, Battery - , Switched Ignition & RPM). Integrated ignition timing control & coil driver. Color touchscreen for setup and gauge views. Calibration Wizard Answer a few questions about your engine and it creates the base map, then starts tuning on its own! Self-tuning ECU means you dont have to be a computer/tuning wiz to have EFI! Available in base & master kits Master kits include complete fuel system: fuel pump, filters, feed and return hose and all fittings including fuel tank return line bulkhead fitting. Rocket Industries Pty Ltd ships goods Internationally and Australia wide. Under no circumstances will parcels be left unattended or without a signature from the receiver. Bank Transfer Below is our bank transfer details. The item is in re-saleable condition, meaning that: (a) It is in its original clean packaging, including instruction manuals and all accessories. (b) It is unopened, unused and in its original condition. Please make sure you have all the above paperwork attached to the goods so there are no delays in processing the return. Goods that are short supplied must be referred to Rocket within 7 days of receipt. Monday to Friday: 8.00am - 5.30pm Saturday: 8.00am - 1.00pm. Rocket Industries is the largest distributor of performance products and accessories in Australia, stocking over 300 leading brands of performance parts & accessories. With brands such as Aeroflow, Autometer, B&M, Edelbrock, K&N, Mickey Thompson, MSD, Comp Cams, Simpson, JE, SRP, Weld Racing and more. We are serious about supplying you with reliability of stock and the right parts, right when you need them. Each individual at Rocket has a genuine passion for motorsport with many staff members have their own street machine, hot rod or race vehicle, or are pit crew associated with a team. Rocket Headquarters in Huntingwood, NSW (Australia). The Leaders in Performance Products. 30+ Years Specialist Importer of USA Brands. Rocket Industries is the largest distributor of performance products and accessories in Australia, stocking over 300 leading brands of performance gear. The item "Holley Sniper EFI Self-Tuning Kit with Handheld Monitor (Black) HO550-511" is in sale since Thursday, November 2, 2017. This item is in the category "Vehicle Parts & Accessories\Car & Truck Parts\Air Intake, Fuel Delivery\Other".